If you’re confused by all the new automatic-transmission types now available, you’re not alone. This Toyota Prius shift lever manipulates a type of continuously variable transmission (CVT). 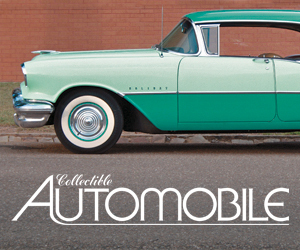 Automatic transmissions have gone through many changes since being introduced by Oldsmobile for 1940, but rarely have there been as many different types offered as there are today. Following are technical descriptions of the four basic types that have been used of late, but if you prefer to simply know how they might affect the driving experience, just skip down to the “On the Road” section. Before getting into the various designs now in use, let’s look at why cars have a transmission in the first place. 1) Disconnect the engine from the drive wheels when the car is stopped, thus allowing the engine to keep turning—or “idling”—while the wheels aren’t. 2) Provide a range of gear ratios that allow quick acceleration from a stop while also letting the engine run more slowly (and thus more economically and with less wear) at constant speeds. Technically speaking, the first function isn’t the job of the transmission, but rather that of a clutch or torque converter. When a car is at a standstill with the engine running, there has to be something that allows the engine to keep turning (“idling”) while the wheels are stationary. In a manual transmission, that “something” is the clutch. Imagine two flat plates facing each other, one connected to the engine, the other to the transmission—and in effect, to the drive wheels. When the car is being driven down the road, the two plates are in contact with one another, thus transferring the rotational force of the engine to the drive wheels of the car. When the car comes to a stop, the driver presses down on the clutch pedal, which separates the plates and allows the engine to turn while the wheels don’t. To get moving again, the driver releases the clutch pedal, which allows the plates to go back into contact with one another. Another way to perform the same function—but without human interaction—is with a torque converter. Imagine two fan blades facing each other with just a small gap between them, one fan connected to the engine, the other to the drive wheels. If the engine-driven fan is turned very slowly—as when the engine idles—the air current coming off of it isn’t strong enough to make the other fan turn. But once the speed of the driven fan increases, the rush of air would cause the second fan to begin rotating. A torque converter works much the same way, except that instead of air it uses an oil-like fluid. Generally speaking, there are two types of transmissions: manual transmissions, which have a foot-operated clutch pedal and a shifter that allows the driver to manually change gears; and automatics, which can do all that for you. Simply put, a manual transmission contains a set of gears for each “speed” on parallel shafts; if it’s a five-speed transmission, it contains five sets of forward gears, another set for reverse. The driver uses the shift lever to choose the proper gear for the situation, just as the rider of a ten-speed bicycle does. The current generation of conventional automatics use a torque converter to transfer power from the engine to the transmission. 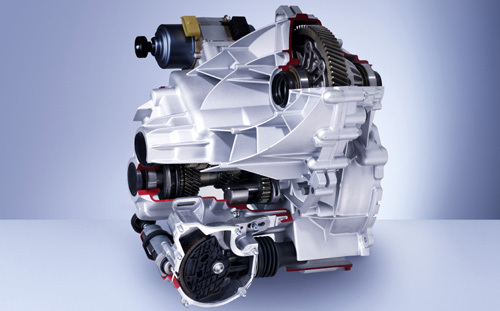 The transmission itself typically contains several sets of gears, and the different “speeds” are chosen by engaging electronically controlled, hydraulically operated clutch packs. Most earlier automatics worked much the same way but didn’t have as many speeds and lacked electronic controls. 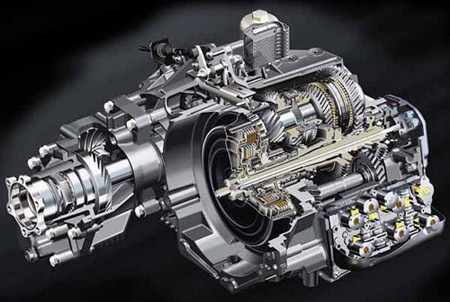 Conventional automatics tend to be very smooth in operation—both upon starting from a stop and in gear changes—but lose some efficiency (and thus fuel economy) due to the slight “slip” of the fluid-filled torque converter and driving the hydraulic pump that operates the clutch packs. Rather than sets of gears, CVTs use a belt that runs between two variable-diameter pulleys to give a wide range of ratios and a smooth transition between them. 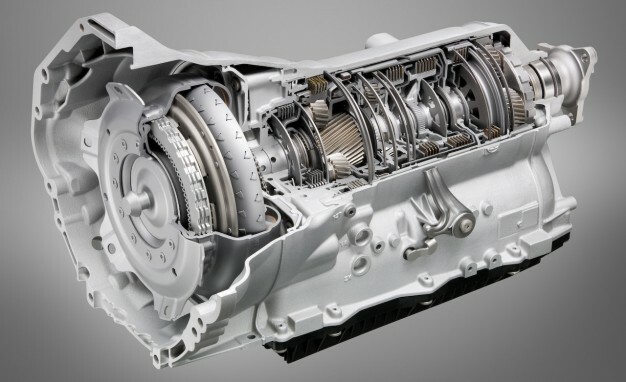 In automotive applications, some CVTs use a fluid-filled torque converter (as with a conventional automatic) to transfer power from the engine to the transmission, others a clutch similar to that used for a manual transmission, but with automatic activation (there is no clutch pedal). The advantage of a CVT is that the engine can be kept at its most efficient speed while the transmission adjusts to changes in load or road speed. Under brisk acceleration, for example, the engine revs up to where it produces the most power and is held there as the transmission constantly adjusts to the increasing speed of the car. Under cruise conditions, the transmission can adjust for small changes in road speed while the engine is kept at a consistent rpm for best fuel economy. A limiting factor is that because CVTs rely on friction between the belt and the pulleys, they haven’t yet been designed to handle a lot of power. Currently, the highest-horsepower CVT application is in the Nissan Maxima, where it’s paired with a 290-horsepower 3.5-liter V6. There are two types of automated manual transmissions in use, with the more modern one (which is now far more common) being called a “Dual Clutch Automated Manual”; it’s described below. Both are essentially manual transmissions where the clutch and shift actions are carried out by computer-controlled, electronically activated mechanisms, so they work without driver interaction, just like a conventional automatic transmission. However, they can also be shifted manually (though still without the driver using a clutch) via a conventional gear lever or steering-column-mounted “paddles.” Automated manuals are more efficient than conventional automatics because there’s no “slip” of a torque converter and no losses from driving an internal hydraulic pump. The earliest versions – which were found primarily in European performance cars – were based on a conventional manual transmission with a single clutch, but the only car still using this kind is the very non-performance-oriented Smart ForTwo. Almost without exception, these shifted in a rather jerky manner (as the ForTwo still does), which is what prompted the newer Dual Clutch type. It gets its name from the fact that there are two gear shafts – one for the odd-numbered gears (1, 3, 5, 7), another for the even-numbered gears (2, 4, 6) – each having its own clutch. When the car moves off from a stop, 1st gear is already selected, and the “odd” clutch is engaged to start the car moving. While this is going on, the computer puts the other gear shaft into 2nd gear. When it comes time to shift to second, the “odd” clutch disengages and the “even” clutch engages, and presto; you’re in second gear. It does the same with the higher gears, which are “preselected” before the clutch for that shaft is engaged. This results in much quicker – and usually much smoother – gear changes than with a “single clutch” automated manual. Automated manuals are often used in performance cars today because they’re more efficient than a conventional automatic transmission, and can handle much more power than a CVT. Branded examples of dual-clutch automated manual transmissions include Ford’s “PowerShift” available in the Fiesta and Focus, and Porsche’s “PDK” available in several of the maker’s vehicles. 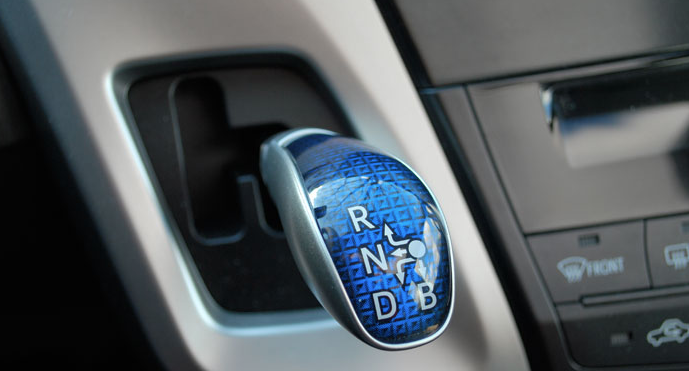 Although the four types of automatic transmissions —conventional, CVT, automated manual, and dual clutch automated manual — all operate without a clutch pedal and can be set to shift for themselves, they each exhibit slightly different driving characteristics. You’re probably already familiar with how a conventional automatic “feels,” so we’ll compare the others to that. Closest in terms of perception to a conventional automatic is the dual clutch automated manual. One difference can often be felt when you’re barely moving. If you’re stopped on a slight upward incline, a conventional automatic will “hold” you there without having your foot on the brake; likewise, your car will creep forward on level ground if you are stopped and take your foot off the brake. Automated manuals often won’t hold you on an upward incline, and may not creep forward on flat ground quite as smoothly as a conventional automatic does. This is most noticed in stop-and-go traffic. Many automated manuals also feel different if you floor the throttle, either from a stop or when cruising down the road. From a stop, they sometimes lurch a bit where a conventional automatic is smoother. If you’re cruising down the road and floor the throttle to pass, an automated manual can often be felt “stepping down” one gear at a time rather than dropping from, say, sixth gear straight down to second. As a result, the time that passes between flooring the throttle and the car actually accelerating is sometimes a bit longer. These all sound like negative traits, so why do some manufacturers use automated manuals? Efficiency. Automated manuals are often credited with about a 10-percent increase in fuel economy. And they’re usually better from a performance standpoint, as there’s less power loss through an automated manual, and under hard acceleration, they are often quicker to upshift into the next gear. A CVT exhibits even more of a difference, notably under acceleration. The objective of a CVT is to have the transmission make most of the adjustments necessary to maintain different road speeds while letting the engine turn at a fairly constant speed—which results in about 10 percent better fuel economy. Under even moderate throttle applications from a stop, however, a CVT maximizes engine power by letting the engine quickly rev up to where it makes more power and then holds it there while the transmission adjusts to the car’s increasing road speed. This means the engine is held at a steady, high-revving speed where it usually makes a lot of noise and sometimes is rather ragged, and this is what is most obvious — and annoying — to many drivers. It used to be that nearly every car that offered both a manual and an automatic transmission scored significantly better EPA fuel-economy numbers with the manual. Not anymore. Although there are a few examples where the manual is still thriftier, many of today’s cars score better with an automatic. Part of this is due to the greater number of “speeds” now used even in conventional automatics — which allow the engine to run more efficiently at any given road speed — and to the use of automated manuals and CVTs. 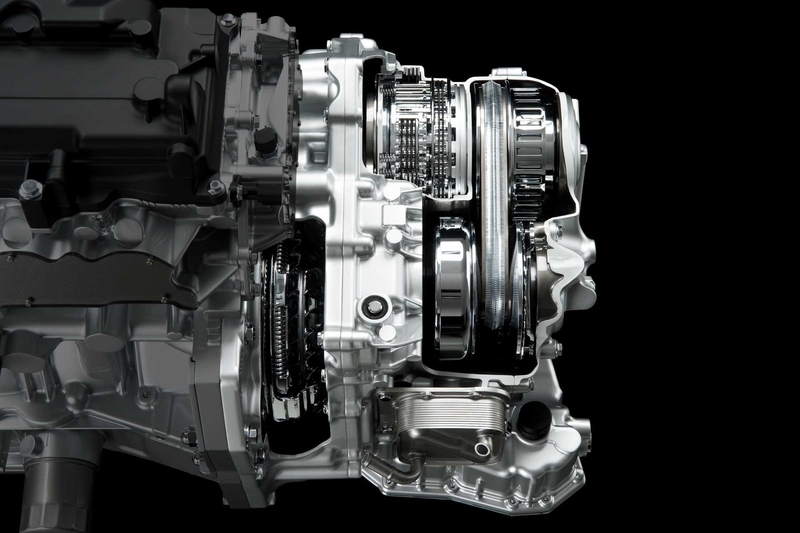 Currently, most manufacturers still rely on conventional automatic transmissions, but the use of CVTs and particularly dual clutch automated manuals is growing. In their best applications, CVTs and dual clutch automated manuals behave much the same as conventional automatics in everyday driving, and the goal is to make them nearly indistinguishable — except for a noticeable boost in fuel economy. Written by: Rick Cotta on July 9, 2014.on June 4, 2018.